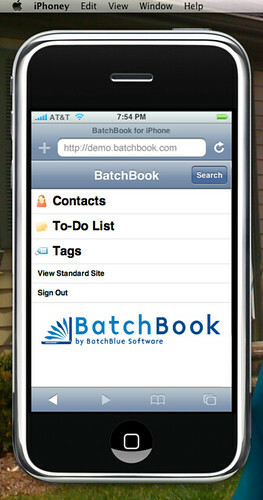 On Monday, I announced the release of BatchBook for iPhone over at the BatchBlue Blog. Check out the post for the details of what features we launched with and what’s coming next. Don’t have a BatchBook account yet? You can sign up for free. 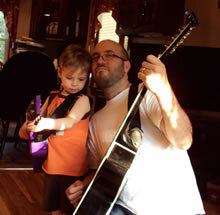 But what I wanted to talk about here is how I set up the development environment. Obviously, designing for a phone is much different than for a desktop or laptop. Luckily, there are plenty of tools available to make developing for the iPhone both a breeze and—quite frankly—incredibly enjoyable. I highly recommend starting with Joe Hewitt’s wonderful iui framework for iPhone-optimized web apps. The framework has a very small footprint, can be heavily customized, and is downright fun to experiment with. Testing can be interesting… you don’t want to keep pushing code live and firing up your phone, so what’s the best approach to take? First, I tried iPhoney. iPhoney is your own gorgeous iPhone sitting your desktop. You can tell iPhoney what User Agent to behave as—the iPhone, standard Safari/WebKit, or more. Once you get to a certain point, though, you need to use some developer tools to fine tune your code. 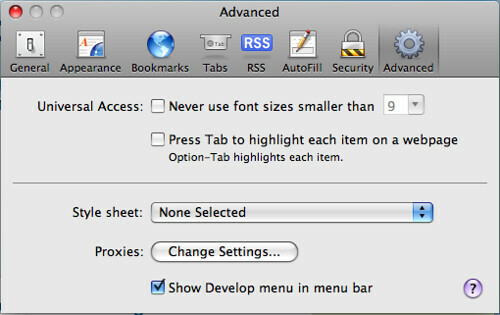 Safari 3.1 came with a bunch of developer tools. Among them are an element inspector so you can see the cascade of styles attached to an element (think a prettier version of Firebug that isn’t quite as powerful). Also, you can choose from a huge list a of user agents. Using the iPhone user agent with the element inspector lets you troubleshoot any display issues you may be having. 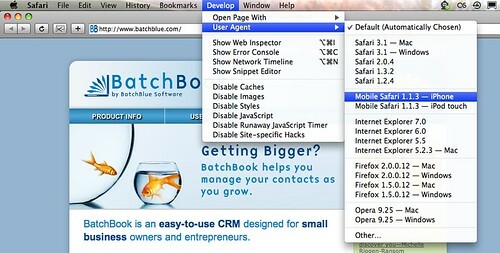 Once you quit Safari and open it back up, you’ll see the Develop menu. 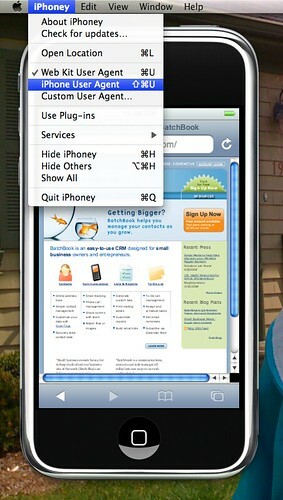 From there, just choose iPhone from the User Agents list and you’re in action! So, have fun! I’m personally looking forward to updating the BatchBook iPhone app and am tempted to play with some other ideas for creating iPhone apps. I have found that working with a totally different canvas (a phone as opposed to a desktop browser) after all these years can actually be quite thrilling. Plus, developing for iPhone means no Internet Explorer!